The new XC40 represents Volvo’s third SUV and is focused on a new expression of Scandinavian design. The XC40 is the smallest SUV offered by Volvo, preceded by Volvo’s largest SUV, the XC90, which is the most awarded luxury SUV of the century. The XC60, which has been introduced earlier this summer, has arrived now and has been positively received. With the introduction of the XC40, Volvo completes its SUV range and offers three of the newest vehicles in their respective segments. The XC40’s bold exterior is available with a range of body colors and color-contrast roof, providing up to 17 combinations. In the front, Volvo’s signature Thor’s hammer daytime running lights compliment a new interpretation of Volvo’s grill. The XC40 has a strong, structured profile for a youthful expression. Large wheels, wheel arches and an 8.3” ride height provide a true SUV feeling. 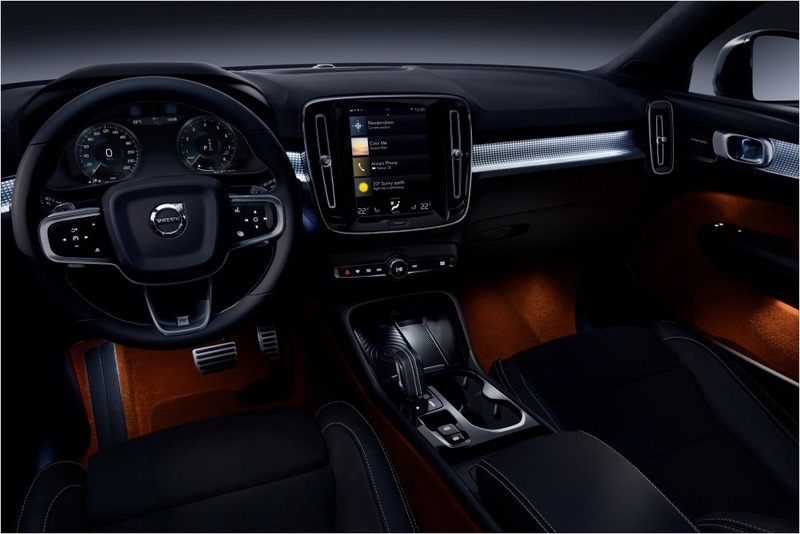 With a clever use of space and interior materials, the XC40 introduces a bold rendition of Scandinavian design and functionality. An available panoramic sunroof allows natural light into the cabin and at night, integrated LED mood lighting can be color adjusted to match the mood or temperature the driver desires. This lighting, combined with unique metal and textile materials, creates a feeling of creativity, energy and youthfulness. Volvo conducted extensive global research into how compact SUVs are used and discovered proper storage is essential. With ample interior space for both passengers and storage, smart daily-use features such as large door pockets, integrated bag hooks and a customizable cargo area help organize the driver’s life while in the car. Wireless QI mobile phone charging and Bluetooth connectivity with the standard 9” Sensus Connect touchscreen helps reduce the clutter of charging cables and connectors. A dedicated cell phone storage space frees up cup holders and other areas commonly used by customers to store their phone. The development of a unique air-ventilated woofer located behind the dashboard allows for more storage in the door panels without sacrificing stereo sound in the cabin. 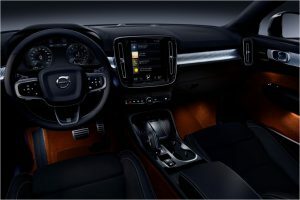 Connectivity is core to the XC40 – lots of applications are available via the center touch screen, as well as Volvo’s Apple CarPlay and Android Auto integration. With standard City Safety, which includes pedestrian, cyclist, vehicle and large animal detection with emergency autobrake, the XC40 is one of the best-equipped small premium SUVs on the market. Safety and driver assistance features on the XC40 include Pilot Assist, Run-off Road protection and mitigation, Cross Traffic alert with brake support and the 360° Camera that helps drivers maneuver their car into tight parking spaces. The new XC40 is the first model on Volvo Cars’ new Compact Modular Architecture (CMA), which will underpin all other upcoming cars in the 40 Series including fully electrified vehicles. Production starts in Volvo Cars’ plant in Ghent, Belgium in November. From start of production, the XC40 will be available with a D4 diesel or a T5 petrol four-cylinder Drive-E powertrain (depending on market). Further powertrain options, including a hybridized as well as a pure electric version, will be added later. The XC40 will also be the first Volvo model to be available with Volvo Cars’ new 3-cylinder engine.